American culture shifted dramatically during the Second World War. The war created dramatic rise in production to arm the American millitary. With the men at the frontlines it became necessary for women to work in the factories in their place. Everyone was expected to assist the war effort. Many women already worked in the factories but most women up until this point remained at home with their children. This situation presented many problems for mothers who were now compelled to work in American factories. With many women working outside the home, childcare became a significant issue. As a result, day care centers emerged to care for working mothers’ children. Day care enabled American mothers to work in factories during the War. The American government played a role in creating propaganda that proclaimed the need for women to work as a patriotic duty. Rosie the Riveter became a national heroine. “A new caricature made the woman worker an angel, loyally staffing the home front arsenals of democracy. Magazines, movie newsreels, popular songs, and public leaders all praised her. Rosie the Riveter was a national heroine.” 1Rosie the Riveter is one example of how the U.S. government stressed the importance of women at work. While some employers may have discriminated against immigrants, “…the President, on July 12, 1942 issued a statement that 'persons should not hereafter be refused employment, or persons, at present employed, discharged, solely on the basis of the fact that they are aliens or that they were formerly nationals of any particular foreign country. '” 2This statement from Franklin D. Roosevelt helped many immigrants, especially women gain jobs in the workplace. Day care became a site of patriotism for many Americans. Such centers provided working mothers with the security that their children would be safe while they worked in factories across the country. Voluntary child welfare agencies “…have been particularly concerned with the children of parents in minority groups, migrant families, and men in the armed forces, many of whom are handicapped because of environmental circumstances.” 3 Immigrants had more of a disadvantage in American society with language barriers, discrimination, and lower incomes. Immigrant women needed day care centers and nurseries because most of these women had to work for a living and places that cared for their children became vital to their situation. While many people and organizations supported working women who used day centers or nurseries, many found fault with this solution. Social workers and child care advocates had the conviction that encouraging mothers to be workers would harm family life [which] led them to resist expanding day care in the early years of war, and then to insist on limiting and controlling it.” 4 Social workers believed that mothers should be at home tending to their children and that it would be a double burden to have the mother both work and then tend to her family. In addition, they believed that by being a mother and raising children could be looked at, in itself, as a patriotic duty to America. They believed that child care would negatively affect the children because “…most day nurseries offered substandard care and were organized with mothers’ convenience rather than children’s welfare in mind.” 5 They thought that a child without their mother’s full attention would be deprived in day cares. Many mothers continued to do it all. Mrs. Mary Kolb, “…was a sheet metal worker at the Navy Yard who had gone to work to help make ends meet after her husband had enlisted. She worked on the night shift so she could care for her three children, but was worn out and ill from the strain and lack of sleep. ‘My, it will be a relief,’ she said, ‘if I can get my kids in the nursery!’” 6 During the war, the number of day care centers increased but not fast enough to accommodate all those who needed it. The Springfield Armory in Massachusetts depended on women workers during World War II. 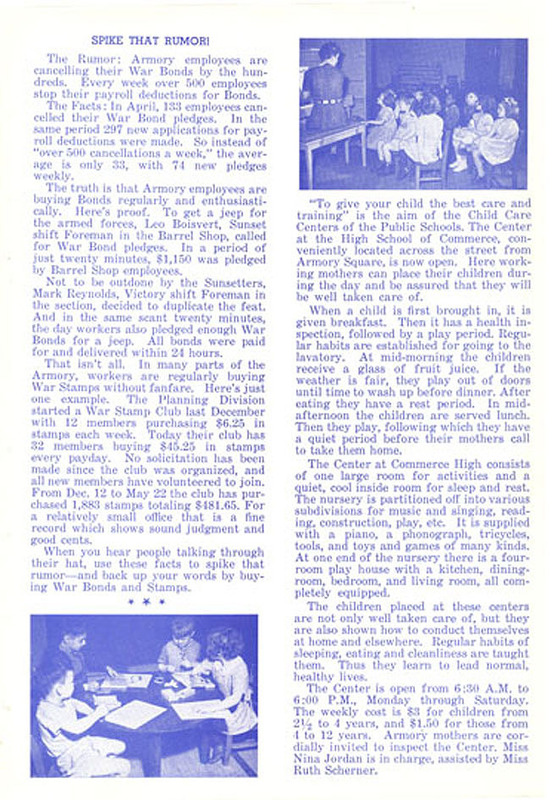 The day care center which was located across the street from the Armory, indeed proved to be a huge benefit for both the women workers and the factory owners. The Springfield factory owners gained more workers due to the day care center provided for mothers who worked there. Also the mothers working at the Armory could now provide for their family with the wages earned while their children received an education. After the war, women no longer worked as a patriotic duty, but they did find other work for their own reasons. Most women, after World War II, realized that they had other options than just being a stay at home mother. They could work for a living while day nurseries provided for their children. The need for female workers during World War II created a chance for women to change their status in America while before the war women mostly stayed at home. Although many people felt that after the war women should return to their homes, many refused to do so. 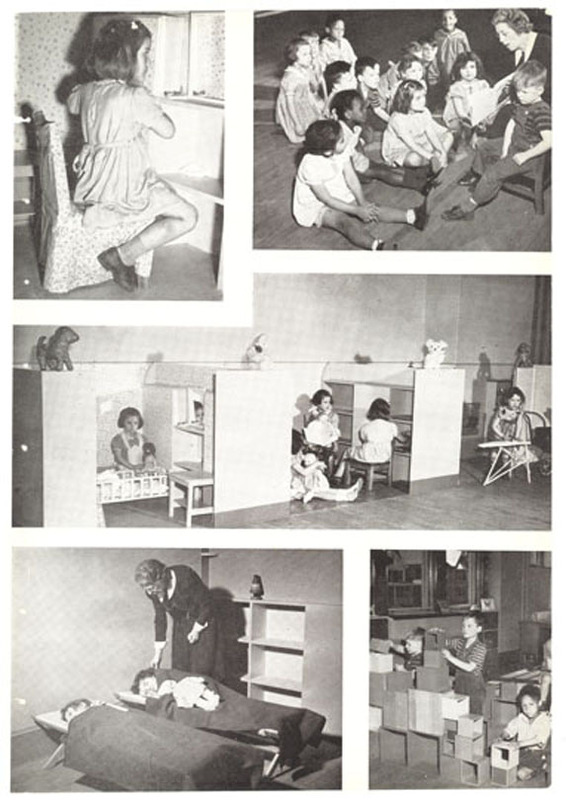 Women relied on day care centers during the war and continued to after the war was over. This contributed to women’s independence and entry into the working world. With the use of day care for their children, women, whom before World War II did not play a large role in the work force, now saw that they too could be self-sufficient and continue to look for ways to improve their conditions.